In February of 2007, I wrote a book review titled “Sticky Stories Told with Numbers” in the Visual Business Intelligence Newsletter of the book Made to Stick by Chip Heath and Dan Heath. I gushed with enthusiasm for this simple, practical guide that teaches us how to get our messages across in ways that result in understanding and action. Given my appreciation for this fine book, I was thrilled when I heard that the brothers Heath had written another, which I finished reading last week. Once again, they’ve given the world a set of clear-headed, easy-to-understand guidelines—this time for effecting change when change is hard—entitled Switch. We who spend our lives searching for the stories that live in data to promote evidence-based decision making often watch in horror when we fail to help decision makers understand the stories and care about them. To effect change, we must not only tell these stories in ways that lead to understanding, we must also appeal to people’s hearts in ways that make them care enough to want the change that we’re proposing, and we must prepare a path for change that makes it easier to follow than ignore. 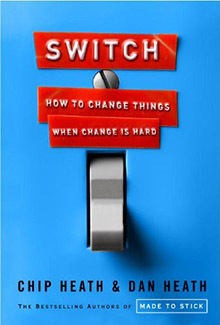 Switch explains why change is often hard and describes clear steps for helping people get from where they are to where they ought to be. This is not a book about manipulating people to serve your own ends. It’s about facing the truth that even when change is good for us, getting from here to there is often a struggle that requires a helpful nudge in the right direction. As information stewards, this ability to nudge people in helpful ways must be part of our skill set. I won’t say more about Switch, because I don’t want you to think that my brief description is sufficient for your needs. Get a copy for yourself. You won’t regret it. Thanks for the recommendation. This is exactly what I need for my work right now. Fingers crossed. Just got it. Second great review on this book. Lets hope I can make this work for me! I really liked and enjoyed both books (Made to Stick and Switch).